Hanover’s Mother Church and the vast Karoo beyond. I’m a presently-lapsed Anglican boy who once attended a DR church service somewhere in a dusky Mpumalanga coal town so I could sit next to a certain farmer’s daughter. I was nearly charged with Attemped Kerfuffling and I never saw that girl again. But now that I’ve begun my middle-aged meanderings through the vast Karoo, I’ve developed a keen eye and a deep appreciation for the exterior aesthetics of a DR Moederkerk. You can’t mistake them. They’re the ones – mostly built in the 1800s – that look like impregnable sandstone fortresses all dollied up with follies and faux, buttresses and beautifully carved wooden doors. And they mostly come with fascinating back-stories. The Cradock Mother Church has its twin in Trafalgar Square, London. 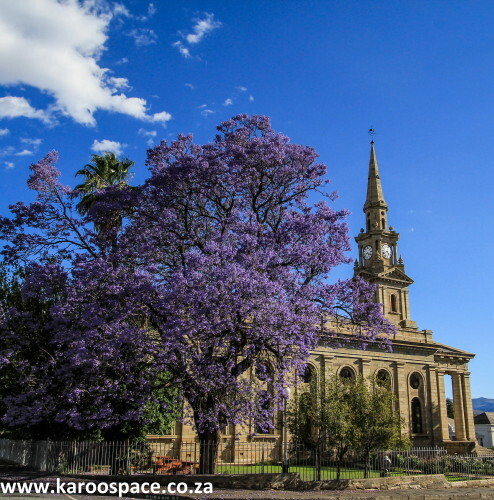 The Cradock Moederkerk looks like a spruced-up version of St Martins In The Field in Trafalgar Square, London. 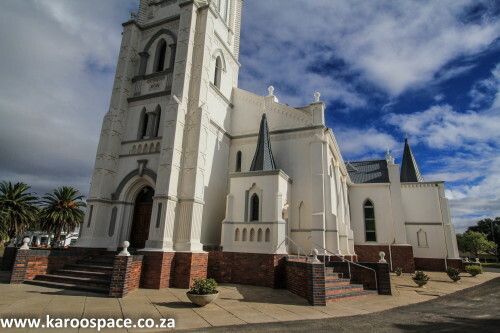 The Graaff-Reinet Mother Church – centrepiece of this grand old Karoo town. 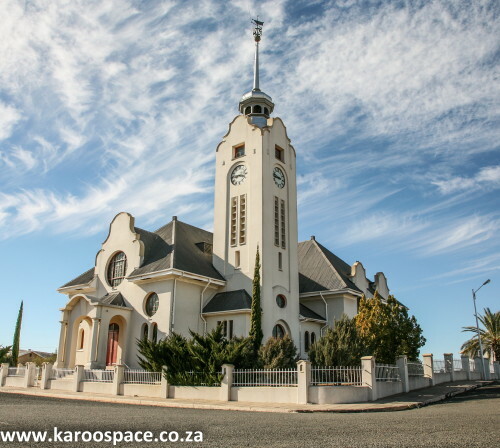 When you drive into the Great Karoo centre of Graaff-Reinet, the Victorian Gothic Grootkerk looms – like its sister in Cradock – over all. A local farmer donated all the stone for this marvelous church – he even cut and prepared the segments himself. One of the interesting design elements of the Graaff-Reinet Grootkerk is the series of small crowned heads carved into the stone. And, interestingly enough, it cost 18 000 pounds – just more than half of what it took to build the Cradock church. If you ever find yourself heading north on the N12 from Klaarstroom to Beaufort West, hook a left at a place called Seekoegat. There you’ll find a lovely lady called Anna Herbst living on a farm. You’ll also find the ruins of a grand old hotel and a little DR church which is very proud of its organ, donated by none other than Cecil John Rhodes himself. They still hold special weddings here and the occasional bazaar, where everyone swaps milk tarts and has a good old country time. The Rietbron Mother Church, with its springbokkie steeple. Now head due east to the dusty little ville of Rietbron, for one major reason: to see the only steeple in the country that sports a springbokkie. Normally, as you know, there’s a rooster on top. The kerk in Koffiefontein up on the Horizon Route boasts a fish – because a long-gone dominee was a keen angler. But mostly, it’s roosters. Except for Rietbron, where the land is flat and Antidorcas marsupialis (the noble springbok) rules. Up in Hanover on the N1, it’s obligatory to climb to the top of the Trappieskoppie if you seriously want to witness the Karoo in all its vastness. Lower your gaze to the town and you’ll see the fine old DR church, where three young Boers were buried after being executed by a British firing squad during the Anglo-Boer War after they allegedly sabotaged a train. The Richmond Mother Church, where the clock was fixed by a Blue Train driver. One of the things I love about the Karoo is most of the church clocks keep time. In Richmond’s case it’s all thanks to one Ockert Botha, former Blue Train driver and repairman of note. A lady from the local old age home begged him to fix the clock chimes because she could not sleep without them. And so he did. Ouma Eileen was so chuffed she offered him R20 just before she died, which was 22 days short of her 100th birthday. 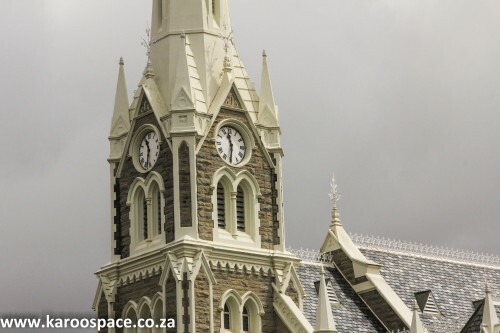 Back in the 19th Century, the DR Kerk churches were built with verve and style. And, it seems, there was no shortage of stone. You had Gothic, you had Wren and, in the case of the Moederkerk in Somerset East, you had a Dutch Renaissance tower rising from a thatched nave on the Eastern façade. Other churches, like the one in Ladismith, were quickly outgrown by swelling congregations. The very elegant Ladismith, Little Karoo, Moederkerk became a storage depot for farm implements and then the publicity office for the town. 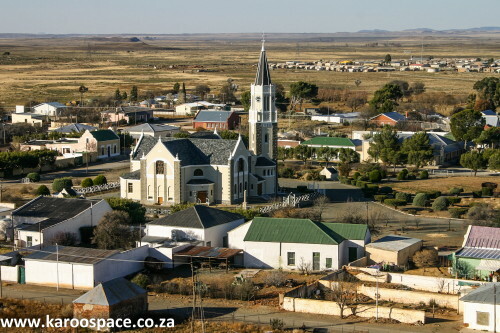 The Prieska Mother Church in the Northern Cape. 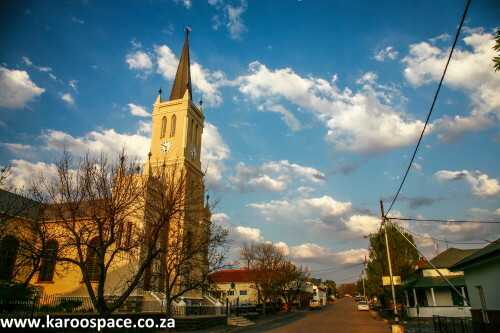 Down an exciting dirt road off the R62 lies the village of Van Wyksdorp, a church settlement with an awesome Moederkerk and a small population of residents. Since its heyday, Van Wyksdorp has slumped into a timeless reverie and is currently very popular with tourists wanting to do the same thing. 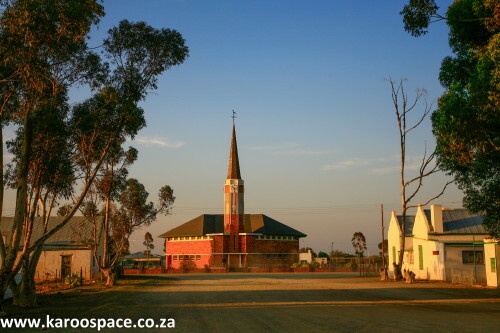 Back in the Karoo Heartland, the DR church in the village of Pearston stands at the foot of the Plains of Camdeboo. Back in the mid-1800s church services were held in the outdoors under a giant pear tree. Knowing a little about Karoo pears in the height of summer, I can only imagine it must have been like dodging baby coconuts under that tree. So when the superb white church was finally built, one assumes there was much relief in the congregation. The Aberdeen Mother Church steps – scene of an Anglo-Boer War shoot-out. The stone and timber used to build Nieu Bethesda’s DR Church was sourced locally, and the lighting system still runs off gas. 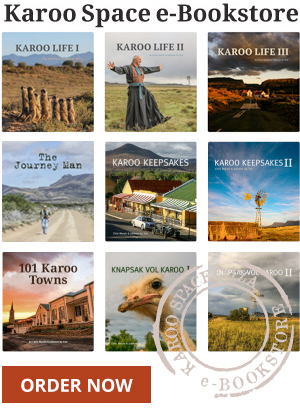 It’s Karoo Travel Season! One of your essential cubby-hole companions for touring the Heartland is the award-winning book Road Tripper Eastern Cape Karoo. Get the Print version HERE and the Ebook HERE. It’s much more than a travel guide. It’s an insider’s look at an undiscovered region of South Africa. What magnificent buildings – I would love to see more of them. Are they still in use? Dankie vir hierdie wonderlike FB-blad. Ek is in 1965 weg uit Aberdeen uit om my matriek in Oudtshoorn te gaan doen. My ouers se grafte is nog daar – Pieter en Hannah van Eck. Van my familie bly nog in die distrik en daarom het ek steeds ‘n noue verbintenis met my tuisdorp waar ek groot geword het. In my hart bly ek maar ‘n Kind van die Karoo al kom ek nie meer so dikwels daar nie. Hoop om in September ‘n draai daar te maak. Gaan voort met hierdie wonderlike blad. Ek geniet elke foto. what a marvellous web site….all credit to you both. I hope you make it a profitable enterprise. I have fond memories of the Karoo from my times living there – oh so many years ago. Quite a contrast with Perth where we have been living for the past 30 odd years. Leave a Reply to Margaret van Eck Schoeman Click here to cancel reply.